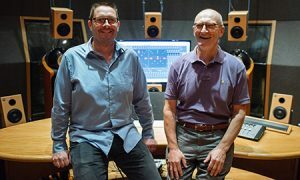 The Immersive Media Lab within the Department of Music Research at the Schulich School of Music is being developed for 3D immersive audio research and production within the McGill Sound Recording Studios. Howie, King and Martin, D. “Listener Discrimination Between Common Speaker-Based 3D Audio Reproduction Formats”, Audio Eng. Soc., Vol. 65 No.10, October 2017. King, Leonard, Howie and Kelly “Real Rooms vs. Artificial Reverberation: An evaluation of actual source audio vs. artificial ambience in the rear height channels of immersive audio systems”, Acoust. Soc. Am. 140, 3275, June 2017. From the proceedings of the 172nd Meeting of the Acoustical Society of America, Honolulu, Nov 30th, 2016. King, Leonard, Howie and Kelly “Real or Illusion? A Comparative Study of Captured Ambiance vs. Artificial Reverberation in Immersive Audio Applications”, published in the proceedings of the 142nd Convention of the Audio Engineering Society, Berlin, May 11th, 2017. Hong, J.W. ; Woszczyk, W.; Begault, D. & Benson, D. “Synthesis of Moving Reverberation Using Active Acoustics—Preliminary Report”, 138th Convention of Audio Engineering Society, Warsaw, Poland. Paper Number: 9326, May 2015. Howie, W.; King, R.; Boerum, M.; Benson, D. and Han, J. “Listener preference for height channel microphone polar patterns in three-dimensional recording”, published in the proceedings of the 139th Convention of the Audio Engineering Society, New York, October, 2015. Howie, W. & King, R. “Exploratory Microphone Techniques for Three-Dimensional Classical Music Recording” published in the proceedings of the 138th Convention of the Audio Engineering Society, Warsaw, May, 2015. Imamura, H., Kim, S., Marui, A., Kamekawa, T., King, R., and Woszczyk, W. “Discovering perceptual characteristics of multichannel music with height ambiences for Japanese listeners”, presented at the 13th International Conference on Music Perception and Cognition (ICMPC), Seoul, August 4-8th, 2014. Kim, S., Ko, D., Woszczyk, W., Okumura, H. “Rendering an immersive sound field using a virtual height loudspeaker: Effect of height-related room impulse responses”, Proceedings of 2013 IEEE 2nd Global Conference on Consumer Electronics (GCCE 2013), Tokyo, Japan, Oct. 1-4, 2013. Kim, S.; King, R. & Kamekawa, T. “A cross-cultural comparison of salient perceptual characteristics of height channels for a virtual auditory environment”, Virtual Reality, ISSN 1359-4338 Vol19 No. 2 Springer Verlag, August, 2015. Kim, S.; Ko, D.; Nagendra, A. & Woszczyk, W. “Subjective Evaluation of Multichannel Sound with Surround-Height Channels.” In Audio Engineering Society 135th Convention. New York, NY, USA: Audio Engineering Society, 2013. King, Leonard, Howie and Kelly (2017) “Real Rooms vs. Artificial Reverberation: An evaluation of actual source audio vs. artificial ambience in the rear height channels of immersive audio systems”, J. Acoust. Soc. Am. 140, 3275 (June). From the proceedings of the 172nd Meeting of the Acoustical Society of America, Honolulu, Nov 30th, 2016. King, Leonard, Howie and Kelly (2017) “Real or Illusion? A Comparative Study of Captured Ambiance vs. Artificial Reverberation in Immersive Audio Applications”, published in the proceedings of the 142nd Convention of the Audio Engineering Society, Berlin, May 11th. King, R.; Howie, W. & Kelly, J. “A Survey of Suggested Techniques for Height Channel Capture in Multi-channel Recording”, published in the proceedings of the 140th Convention of the Audio Engineering Society, Paris, June 7th, 2016. Martin, B.; King, R. & Woszczyk, W. “Subjective Graphical Representation of Microphone Arrays for Vertical Imaging and Three-Dimensional Capture of Acoustic Instruments”, Convention Paper 9613, 141st Convention of Audio Engineering Society (October), Los Angeles, USA, 2016. Sunder, K. & Woszczyk, W. “Investigation of Impulse Response Recording Techniques in Binaural Rendering of Virtual Acoustics”, Convention Paper 9609, 141st Convention of Audio Engineering Society, Los Angeles, USA, 2016.